Its been raining here from past one week and the temperature has dropped to around 15 degrees and some days even less, and the worst part is the wind. The cold freezing winds blowing all day long. We removed the winter clothes, sweaters, pullovers and jackets from the bottom racks… the autumn is here and winter is not very far. The starting of autumn and winter is very depressing, I miss the sun, the warmth. So to make us feel better, I baked this cheesecake last weekend. You all must know how much we love mangoes, in this post. So I have mixed my two loves, mangoes and cheesecakes and the result was divine taste. To prepare the crust: Blend all ingredients together in a food processor and press it onto the bottom of 9″ round spring-form pan and bake for about 12 minutes or until slightly brown. Keep aside to cool. To prepare the cheesecake batter: Whip mascarpone, vanilla extract and sugar until smooth. Make sure that there are no lumps, before you add the eggs. Add the egg, one at a time. Whip well for 1 or 2 mins on medium speed. 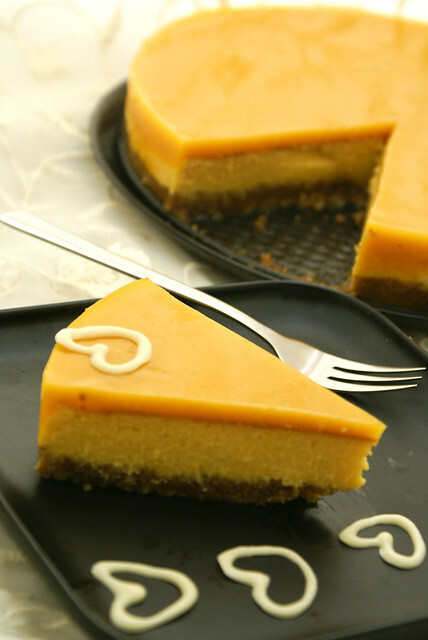 (Over-beating incorporates additional air and tends to cause cracking on the surface of the cheesecake). Keep the beater aside. Melt the white chocolate(if using) and with a rubber spatula, mix it into the batter. Now, add the mango pulp and mix well. Pour onto the prepared crust. Bake in waterbath(wrap the bottom of your springform pan in aluminum foil and place it in a larger pan with water in it, just halfway up the outside of the springform pan) at 210 degrees C for about 40 minutes(+ or – 10 mins : every oven is different so check in between), or until the edges are set but the center is slightly jiggly when shaken gently. For the Mango gelee: Dissolve sugar in the mango pulp. Soften gelatin in half cup water. Squeeze and add it to 1/2 cup of warm water. Stir until gelatin is dissolved. Add it to mango pulp. After the cake has cooled, pour the prepared mango gelee on the top. Refrigerate overnight and serve chilled. 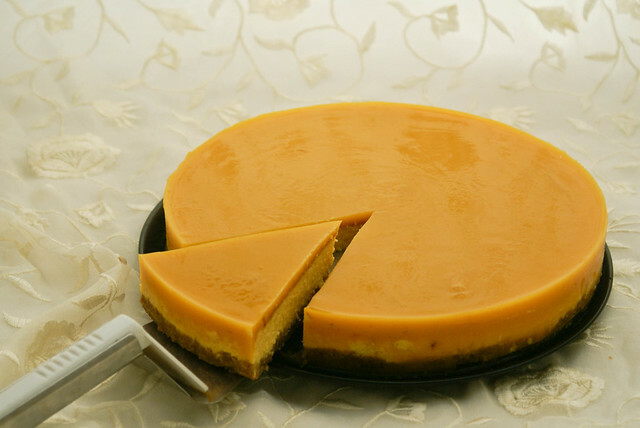 A spring-form pan (with removable side and bottom) is the most preferrable pan for making cheesecakes. Avoid over-baking. The cheesecake will continue to bake after it is removed from the oven. 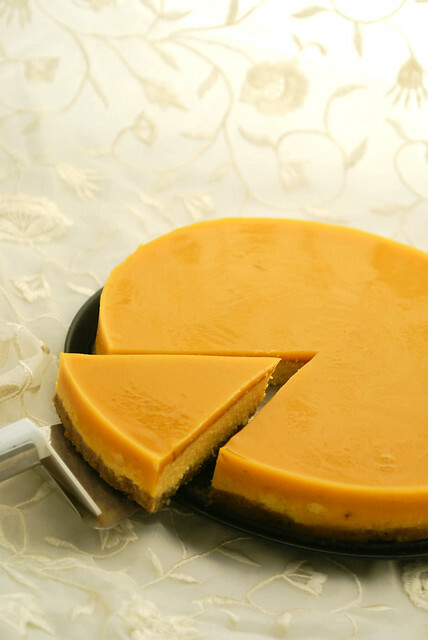 The center of the cheesecake should be just slightly moist when it is ready to be removed. Bake the cheesecake in a water bath to keep the oven moisture high and the heat gentle. Love the layering of flavors here! Just the idea of a mango cheese is heavenly. You did a wonderful job on this-the pictures are stunning. I am now craving a slice! 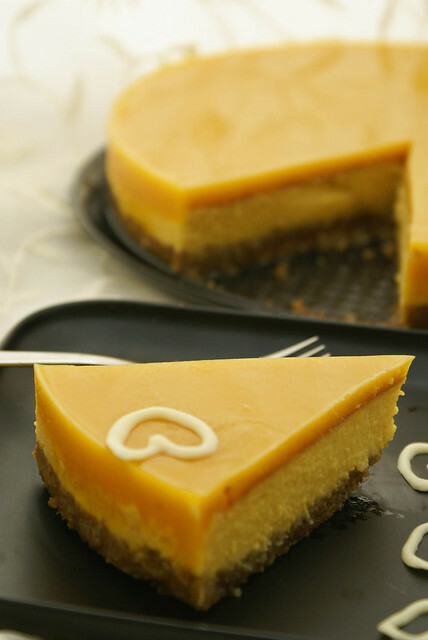 Omg, cant take my eyes from ur clicks, irresistible mango cheesecake..
lovely finger licking delicious and tempting cheese cake. Mmm Mouthwatering cheesecake !! mango is my favourite flavour !! love it !! Great work dear !! First time here u have wonderful space here !! Glad to follow u !! Ongoing Event – CC-What's For Friday Dinner?? Wish i had a slice they looks absloutley super yumm. Wow….awesome cheesecake…feel like grabbing it right now…. Looks perfect…such lovely pictures too..cant take off my eyes to your perfection..
Looks so delicious. Anything with mango is so welcome. Looks impeccably done, wonderful layers and flavors! These Cheese Cake is awesome I like the mango gelee, so delish.